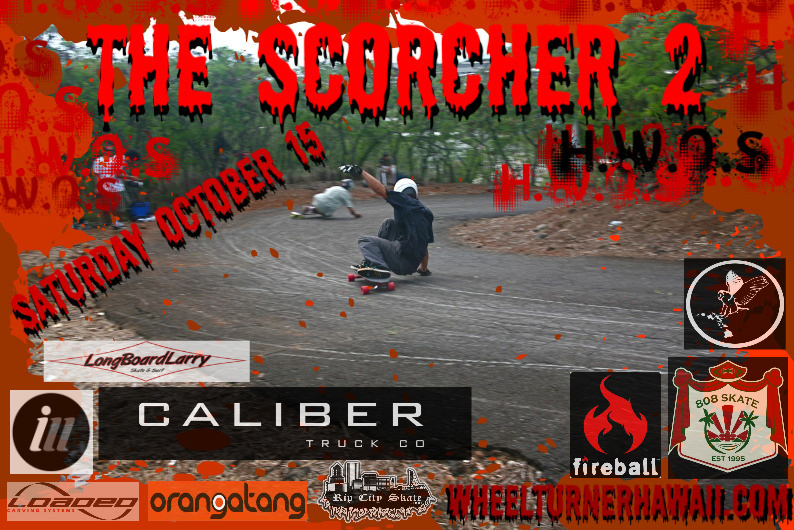 WheelTurnerHawaii.com: The Hawaii Winter Outlaw Seires Event 2 - The Scorcher2 Invitational. The Hawaii Winter Outlaw Seires Event 2 - The Scorcher2 Invitational. 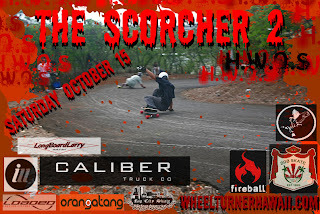 The Scorcher2 invitational will be the second event of the 2011-2012 Hawaii Winter Outlaw Series. This head to head race will take place on Saturday, October 15 @ The Scorcher. The Scorcher is known for its steep, back to back hairpins with rough, cracked pavement. Last year's event showed how gnar the course conditions are while going fast, but it also showcased some of the most intense racing Hawaii has seen. This event is an INVITATIONAL. Racer's and their personal guests are allowed only. We need to keep it this way to ensure the safety of the racers and spectators. The one on one race bracket also takes some time to run and we want to make sure we race for full placing. The TOP 16 racers from event 1 are automatically invited, and i will contact the rest of the invitees. EVERYONE WHO WANTS TO RACE please send your name to stokedskaters@aol.com by the 12th. If you have any other questions or are a visitor who wants to race, feel free to email me. See everyone at The Scorcher2. Roll out to the hill @ 10:30 sharp. All racers must sign the waiver form. IF ANYONE ON THE INVITE LIST KNOWS THEY WILL NOT BE RACING LET ME KNOW ASAP SO WE CAN FILL YOUR SPOT.